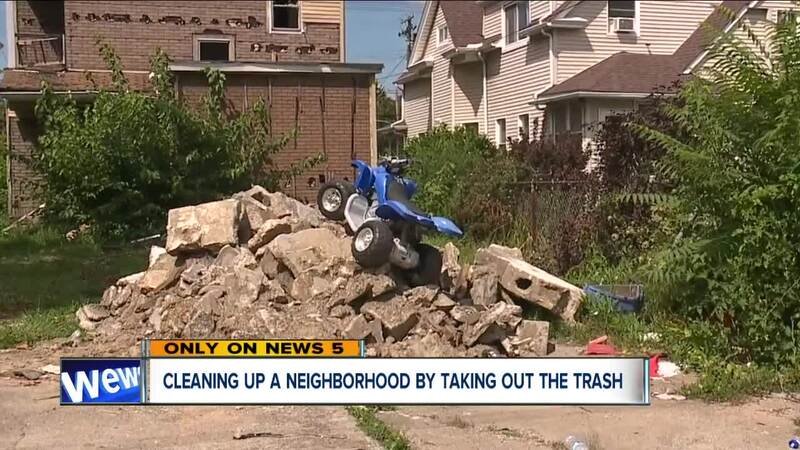 Cleveland’s Stockyards neighborhood sees the worst of the worst when it comes to illegal dumping —garbage piles up in alleys and on vacant lots. In the seven months since she’s been in office, Councilwoman Jasmin Santana said illegal dumping has been the number one complaint she has received, prompting her to take action. One way her office is combating the issue is by organizing “dump days” throughout the summer. The third one wrapped up this weekend. A giant dumpster set up on the corner of W. 50th Street and Storer Avenue is free for residents to dump in. Within hours, each time, the dumpster has been filled to the brim. Inside there is lumber, furniture, mattresses and more — things that would usually clog up a back alley behind residents’ homes. Cleveland City Council members receive four free dumpsters a year for their wards, but Santana knew that wouldn't be enough for Ward 14. She allocated specific funds in her budget for the extra dumpsters, which cost roughly $400 for the weekend. The city drops them off and removes them. “Such a big problem, such a small solution,” Santana said. So why does the Stockyards neighborhood see so much trash and illegal dumping? According to Santana and Metro West Community Development clean-up manager David Reuse, it’s because it’s the first neighborhood you come to if you’re turned away from the Ridge Road Transfer Station , which has relatively strict requirements. “It’s a never-ending battle,” Reuse said. He added that the dumpsters seem to be helping already. Santana said they are also working to analyze data and identify dumping “hotspots” where they will soon install cameras in the hopes of discouraging the crime. The next Dumpster Days are Aug. 28 at the Lincoln West High School parking lot and Sept. 8 on the corner of W. 39th Street and Mapledale Avenue. The Dumpster Days are coupled with a community clean up from 11 a.m. to 2 p.m. If you see illegal dumping in progress, call 911. If you come across it after the fact, call 664-DUMP (3867) to report it. You could be eligible for a reward.